The iPad…it revolutionized everything from web browsing and emailing, to photos, videos and more. With its versatility of applications, it truly dazzled businesses and individuals alike. iPad use for presentations has skyrocketed at an exponential level. And although it will run iPhone apps, it is best to optimize them to run on the iPad. This allows the device to take advantage of its larger resolution screen, and enhance user experience in terms of video, AR (Augmented Reality) and other media. App Development Wisconsin can help to optimize iPad apps, or build one from the ground up, specifically designed for the iPad. With it’s streamlined design, portability, large, bright display, ‘always on’ state, and ability to store apps locally on the device, the iPad is an ideal presentation tool. 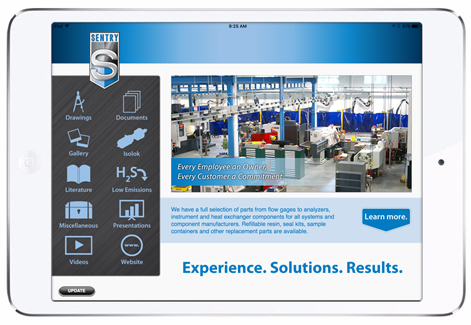 Imagine delivering sales presentations or working the trade show floor with a custom iPad application; being able to show your company’s products, services, literature, videos and spec sheets in their most favorable light. All with or without a wi-fi connection. An iPad app is a unique platform, going beyond any website or desktop application. We can help guide you as we build an intuitive, attention grabbing interface and feature-rich iPad app that builds audience loyalty. We’ll work closely with you from the initial brainstorming session through guidance on deployment to help you achieve your goals. Working in partnership, our team of experts will ensure we deliver an application that is elegant in design and user experience, technically sound, adheres to iPad platform standards and achieves your business objective. App Development Wisconsin can develop custom iPad apps or optimize an existing piece of software or app for the iPad. Our iPad developers are skilled at implementing Apple’s SDK using Objective-C, Swift and Xcode to develop your app. Leveraging the best of Apple’s technologies and using supporting frameworks, our iPad app programmers create a tightly-integrated native app experience that makes adding animation, networking, custom styles and behavior to apps easier. Combining our designers’ expertise in user interface design and our proven app development process we can deliver the reality of the app that you envision. App Development Wisconsin is dedicated to developing iPad apps that make your internal people more productive and your customers more loyal. Whether your app is a re-deployment of an existing application, or a brand new sales, training, productivity or marketing tool, we will work with you to develop a custom designed application that maximizes the user experience. We also offer our own proprietary sales presentation platform, CustomPitch, which, is a custom branded, updateable iPad presentation app that allows you to store and present all your materials from within one app. Contact us for more information on app development using iPad or to set up an iPad app development strategy meeting. Must go through Apple approval process. You can share your application with up to 100 other users through email, or by posting it to a web site or server. This is primarily used for beta testing. In-house apps do not have to go through the app store. They can be hosted on a website, file sharing system, or simply emailed directly to users. Installation for the user is as simple as syncing with iTunes or downloading from a secured site. This method is for tightly controlled content and apps and is primarily for in-house use only. App Development Wisconsin can help guide you through the distribution process. for more information on iPad app development or to set up an iPad app development strategy meeting.